Post subject: 11.75" to 12" for Softball Infield??? Location: South Carolina... Transplanted from Good Ole Colorado!!! Hey All, Anyone else like using a smaller glove for playing softball infield??? I may start playing softball again here in the near future. it's been about 5 or 6 yrs since I've played, but when I did play it was usually SS or 3rd. I remember using a 11.75" to 12" glove and felt really comfortable using it. The other guys always said I needed a bigger glove and teased me, because my glove (baseball) was so small compared to the "shovels" they used. They never said anything when I was able to snag a ball without any issues... .
Do anyone else use a small glove when they play the infield and what do you think too small would be in your opinions??? Thanks in advance, Take Good Care, and Be Safe Always... Time to get to work . I use a 12" for infield softball. I could easily use a 11.75" too and wouldn't miss a beat. Use whats comfortable, don't listen to some idiot with a 14" glove. Huge gloves for softball are seriously over rated. Nike SHA|DO Elite J 12.5"
Agreed with evil, I use a 12.5 in the outfield...that is what is comfortable to me. 12 3/4 Rawlings Trap-Eze = great softball glove at any position for me. Broken in like an infielders baseball glove (NOT long, NOT thumb to pinky w a square heel) and its one of my favorite gloved ever. The flexibility and unmatched strength of a Full Trap-Eze is also great for softball. I could never understand the guys that used a glove as big as they were ??? To each their own... like mentioned "A Matter Of Preference" . A Trap-Eze is something to consider... Hmmm??? 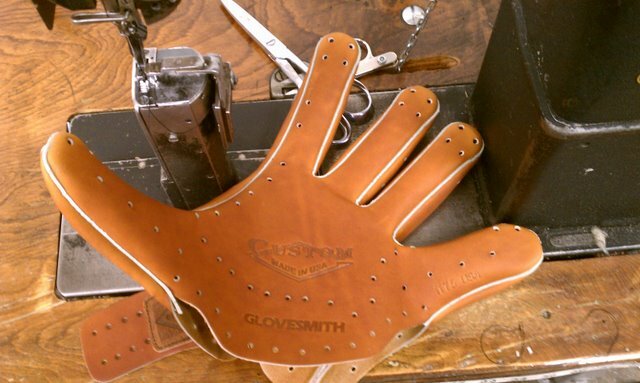 Have you seen Augie's new Glovesmith 1225? This is one of the three Glovesmith patterns designed for softball (1225, 1300, 1350). I think the 12" Nokona AMG175 is a pretty sweet SB infield glove (see the BM76 pics). It has so little to do with the glove size and a great deal to do with your skill level....a glove that has a deep pocket, even it is small, can envelope a softball with ease. And...the bigges thing that will help you get to bad hops is not a big glove, but a glove the is light.....smaller gloves = lighter gloves=faster hands. And listen to your experience.....the clowns with the Ryan klesko Bozo gloves might need them....but you might not. +1... I Totally Agree!!! I have to sit back and just shake my head every time I see one of these guys with the huge gloves "boot" a routine grounder, because they don't play they hop, back up on the ball instead of charging it, thinking they can snag the ball with just the size of their glove... Experience and Fundamentals!!! It's not all the players... It's that one guy that talks trash, tells you how to play your position and uses a glove bigger than he is??? Have you seen DuaneV's black 12" single post BM76 in the Nokona forum? It is another excellent softball pattern. Hey Rous, I just looked at the pics... Sweet looking glove !!! That might be a glove I'll consider. I was actually looking at the Nokona Bloodline BL1200CBLK. Since I'll just be starting back into softball, I ordered a 12" Rawlings Sandlot model (SL120BB). It reminds me of the glove I did use when I was playing a lot (someone wanted it more than I did during a tournament ). It was a Rawlings I found at Wal-Mart... inexpensive glove, but that little glove helped me make the plays when I had to. It even assisted me in a charity tournament where I made 18 of the 21 outs while playing SS... I was just in a zone that day . After it disappeared, It was later replaced with a Louisville TPX 12", which was a "brick" to break in, but wow was it worth it . I play in a few coed leagues in the area and I just recently picked up the nokona pro line 1200... and its FRIGGEN AWESOME!!! not overly huge so you don't feel like you have a tennis racquet on your hand, yet the pocket is so deep it swallows up anything!! I've got to agree that it is more about your skill and playing experience then it is about the glove. I play mostly short and a bit of third and I stick with the 11.5 that I used for hardball. I don't know how anyone plays in the INF with a 13, although to be honest I've never liked anything that big. It might seem at first that the softball is huge in a 11.5, but it doesn't hurt the play. If anything it is easier to find the ball in the glove and to get rid of it. I would say that, for me anyways, the thing I care most about is the comfort level. I can trust my gamer, I know how it plays and how I use it. I think the 12" Nokona AMG175 is a pretty sweet SB infield glove (see the BM76 pics). Totally agree with this ... I love my Nokona AMG175, in full Buffalo leather, for softball infield. I like that it opens really wide and it does not let go of a softball. As an example, last night, I made two fully extended diving catches on screaming line drives to my backhand (behind the bag at second, while I was playing second). On both of them, the ball stuck and locked in while I was hitting the ground hard on one and the second was pretty high and I went heels over head cartwheeling. That ball didnt jostle a bit. For outfield I've been using a Rawlings HOH 12.75 H-web PRO302DC. Its been broken in for a stiff baseball glove and for softball I have to work it open before the pitch, I don't feel I have much margin for error due to its stiffness and having to work to open it wide, so I might use it as a baseball only glove and break in a trapeze for softball, which may not be much different, but it gives me an excuse to get a new glove. I have used 11.75" or 12" gloves in the IF in softball for a few years now. It's all about control. Last week I was that guy that was hanging out watching my brother play in jeans and running shoes, they ended up being short and I had my 13.5" Vinci TJ1952 in the car, but not any of my other gear. They put me at 2nd and the glove was just too big. I definitely prefer my 11.75" JV26 and my 12" MEO24 in the IF over my TJ1952. Now, in the OF, I have used my 12" gloves and have had no issues. I like to use the TJ1952 in the OF because it's the OF. Just gives me that extra little confidence with the bigger glove than the 12" does. But, i have no issues controlling it in the OF like I do in the IF. All in all, if comes down to personal preference. A lot of guys are haters and want to make excuses for their own or their teammates mistakes. A lot of times it comes down to the equipment they are using. Use what you are comfortable with and what gives you confidence. Hate to revive an old thread, but thought I could share some pics of my softball gamer. It's a custom Castañeda glove, an unnoticed and my favorite mexican brand (I'm mexican btw). It is a 12" H-web glove, with a nice deep pocket.I use it for 3B and SS. I only play softball in summer, when there's no baseball in my league, becuase the season goes during the school period. The glove is in great shape. Sorry for the bad quality pictures, I don't have a good camera at home. Last edited by G13 on Thu Oct 25, 2012 10:41 pm, edited 1 time in total.